This is not your mama’s Mini Key Lime Cheesecake – LOL. Growing up, cheesecake was always one of my family’s favorite desserts, and believe it or not it still is. My aunt is famous for her cheesecake and even today it’s the most requested desserts at our family gathering. It’s so smooth and silky and is one of the best cheesecakes I personally have ever tasted. It’s very decadent as its made with the ever so delicious tasting sweetened condensed milk. I definitely plan on posting my aunt’s famous cheesecake on the blog in the future. However, today, I’m sharing a tip on taking a decadent cheesecake dessert and lightening it up as way to cut back on calories, fat, and sugar. Think – Greek yogurt. Yes, Greek yogurt. Greek yogurt is an awesome ingredient that you can add to many recipes if you’re looking to add moisture, lower the fat content, or for a luscious creamy texture. It’s low in calories but high in protein which is a good thing. These healthy Mini Key Lime Cheesecake parfaits are not only adorable, but they’re nutritious. If you’re looking for a healthier dessert option, these would be the perfect substitute. Actually, I’ve even eaten one for breakfast. They have the perfect balance of citrus from the limes, creaminess from the Greek yogurt and cream cheese, and texture from the vanilla wafer crust. Greek Yogurt: I use plain although vanilla Greek yogurt would work great also. Please note that if using vanilla Greek yogurt omit the serving of honey or agave as vanilla Greek yogurt would add additional sweetness. Cream cheese: I use 1/3 less fat cream cheese. To be honest, I can’t taste the difference between the regular cream cheese and the 1/3 less fat cream cheese. Either one will work perfectly. This is a preference. Citrus: I use actual limes instead of key limes. Who wants to go through the hassle of juicing a bunch of tiny key limes. Definitely NOT me. Limes work perfectly. This is a stress-free dessert and should be treated as such. Vanilla Wafer Crust: I like to use vanilla wafers or nilla wafers although graham crackers would work perfectly fine. This is more of a preference. I didn’t add any butter to the crust; however, had I been making an actual pie crust, I would have used butter as a binding agent. *Tip: Make sure the Greek yogurt and cream cheese are at room temperature. When these ingredients are at room temperature, they combine easily and makes for a really smooth and creamy texture. 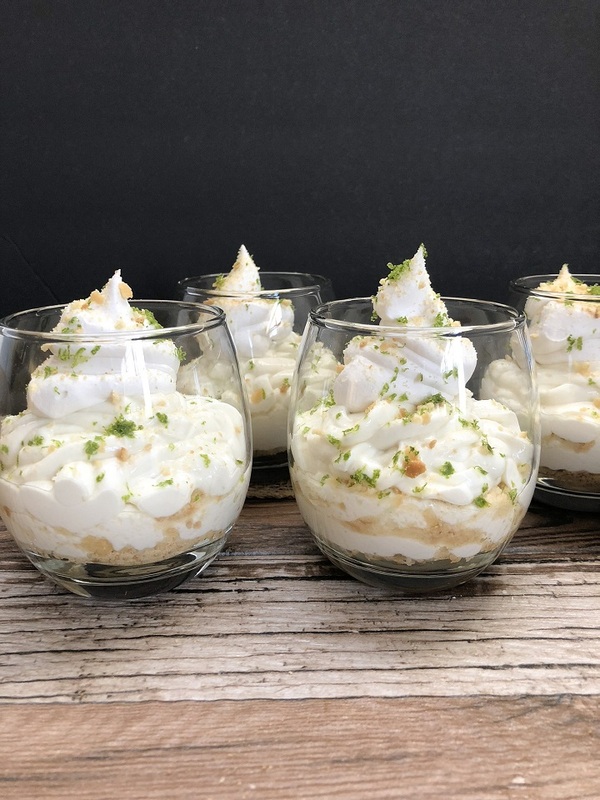 Looking for a quick and easy no bake recipe for your next after dinner dessert, try these Mini Key Lime Cheesecake Parfaits. Let me let you in on a little secret, I’ve actually had one of these beauties for breakfast too. Hey, and they would make for an awesome dessert spread at your next gathering. If you like this recipe, you might like my simple Strawberry Shortcake Parfait recipe or maybe this Peach Parfait Recipe. 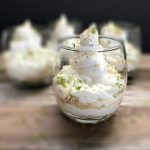 Mini Key Lime Cheesecake Parfaits, a light, airy and healthy no bake dessert, made with 6 simple ingredients. Did anyone say... Greek yogurt. 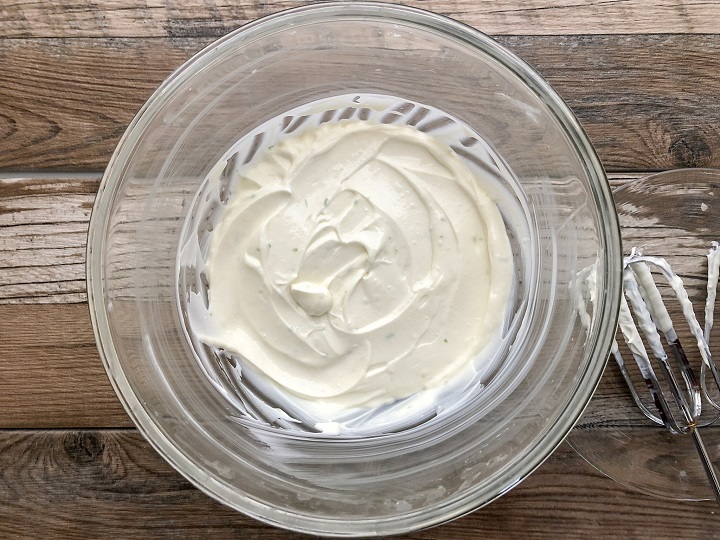 Bring Greek yogurt and cream cheese to room temperature by placing on counter top for a couple of hours. This will allow the cream cheese to soften which will make it easier to cream. This will also allow the cream cheese and Greek yogurt to incorporate more easily. After cream cheese is at room temperature, place in a mixing bowl. Using a hand-held mixer, beat the cream cheese until it's creamy and fluffy about 2 minutes. Add in the Greek yogurt and mix until both are incorporated. Add honey or agave, fresh lime juice, lime zest, vanilla extract and mix with a spoon until all ingredients are combined. Align mason jars or glassware and begin to layer filling and crust. Begin with a bottom layer of crust, then add filling, and repeat with another layer of crust, filling, top with a dollop of whipped cream (either store bought or homemade). Garnish with lime zest and sprinkles of crust. Refrigerate for an hour and serve. You can also refrigerate overnight. They also make a great breakfast or snack. It's important that cream cheese and Greek yogurt are at room temperature. Can you freeze the Key Lime parfaits for later use if you have too many? Hi Steffi – I hope you are well. I’ve never had too many left over that was worth freezing. Usually, when I make these parfaits for my family or guests I may have a couple left over, and if I do they would get eaten for breakfast or as an afternoon snack the next day. Unfortunately, I’m not 100% how they would hold up in the freezer or for how long. I’m sorry. In the event that I try freezing, I will update this post and comment. Thank you so much for visiting.